Traditional stone oven baked Italian pizza with crispy thin dough. 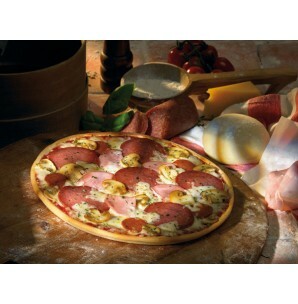 Toppings of pizza 'Speciale' are tomatoes, fine salami, mushrooms (champignons), ham, spicy peperoni and Edamer cheese. Simply bake in your oven and enjoy this rustic, crispy and juicy pizza with a lot of flavours.